I sorta got a bee in my bonnet about those lamps I bought at Target (pronounced “Tarzhay”) last week. I want to fill them with shells. I bought some long BBQ skewers to use like chopsticks to manipulate the shells around inside the lamps. 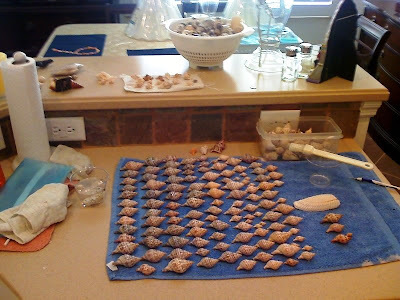 And then I shined all the shells that I collected last weekend during the All-Night Shelling Extravaganza. 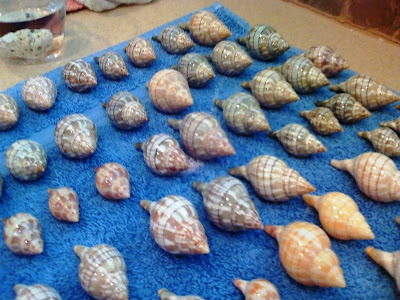 For smooth shells, you can just oil your palms and roll the shell between them. However, I’ve recently discovered the efficiency of a basting brush for shells with a lot of nooks and crannies, such as king’s crowns. But after I was done, they only filled that there collander you see on the breakfast bar in the photo above. Well, that won’t even fill ONE of the lamps, never mind the matched set. 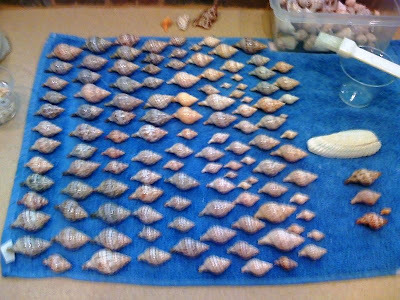 So then I decided it was high time I shined all the shells I’ve been collecting all these years, so I would have more shells to help fill these lamps. I started with the tulips. I had to go into the closet in my office and pull out the big Rubbermaid bin with all the stuff from 2000, 2002, 2004, and 2005; all those years I vacationed down here before deciding to relocate from NY. The stuff from 2006 and 2007 lives in bins in a kitchen cabinet, since I got that stuff while living here, so I pulled that stuff out too. So, here are a fair quantity of banded tulips of all variants and sizes, soaking up a bunch of oily goodness. Previous PostSome booty from the weekend (SHELLS! )Next Post"Filler"